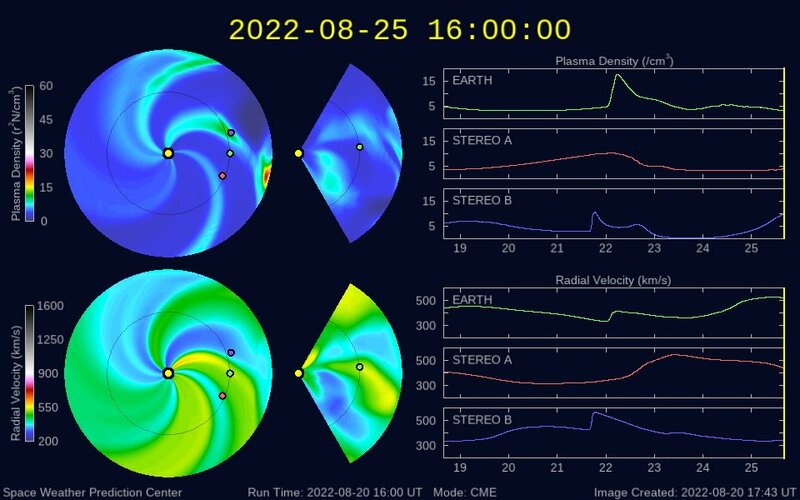 Examples of solar wind prediction from NOAA are shown above. 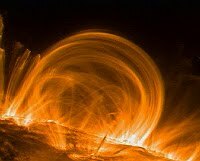 It should be noted that modern space weather studies is dependent on an armoury of computational modelling tools a key topic of this blog. We have included in this list satellites monitoring the near earth environment, the magnetosphere and the solar wind. The list of instruments used is huge including spectrometers, coronagraphs, charge analysers, mass spectrometers, telescopes and magnetometers. 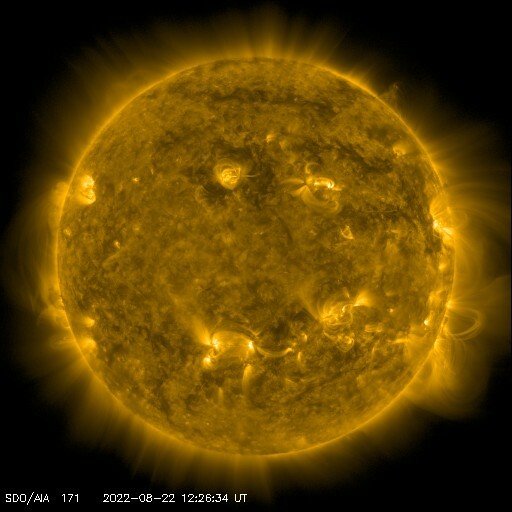 SDOs purpose is to study solar variability and the space weather which results from that. 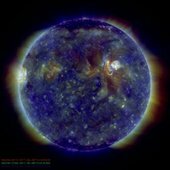 Whilst the HMI are the main instruments for monitoring magnetic variability the AIA provide views of the solar corona extending to 1.3 solar diameters. The AIA covers 10 wavelengths and provides a resolution of 1 arcsecond with a cadence of approximately 10seconds. This level of data provides excellent opportunities to improve our understanding of the activities and dynamics of the solar atmosphere. The range of wavelengths covered by the AIA provides opportunities to study the propagation of phenomena through the layers of the solar atmosphere. The solar orbiter is an ESA mission partnering with NASA one of the objectives is to perform close observations of the polar regions of the sun. Observations would be made from distances as close as 45 solar radii (0.22AU). Solar orbiter has a range of instrumentation for solar remote sensing, including EUV imagers covering different depths through the solar atmosphere, high resolution and full disk imagers. The METIS coronagraph will provide imaging of the corona at 121.6nm. An important feature is that observations willl be coordinated with those of the solar probe plus mission. The solar probe plus mission will use gravity assist from Venus to acheive increasingly close distances to the sun to approximately 8.5 solar radii. The range of instruments it includes is as follows SWEAP for analysing the composition of the solar wind. A suite of magnetometers and antennae for modelling the characteristics of the electromagnetic fields. The Thor mission is part of the ESA Cosmic Vision 2015-2025 the purpose of Thor is to investigate plasma heating and energy dissipation. The figure above shows the formation of turbulence at the bow shock as seen by the global hybrid-Vlasov simulation code Vlasiator. The figure shows a zoomed in cut from the full simulation, where zooming has been done on the quasi-parallel part of the shock where the strongest turbulent fluctuations are observed. The full simulation box extends from -10 Re to +50 Re in X, and +-50 Re in Y. The ordinary space resolution in this run was set to 227 km (of the order of the ion skin depth), while the velocity space resolution is 30 km/s. Color-scaling depicts density, solar wind flows from the right-hand-side-of the simulation box, while the interplanetary magnetic field forms a 30 degree angle with respect of the Sun-Earth line. The waves in the lower part are the foreshock waves due to solar wind ion reflection at the bow shock surface. we are expert in manufacturing the electric appliances. we make many parts which related the electric world. we are serving in solar panels manufacturing, DP panles and DP, motor control panels, manual power factor , PFI, LT switchgear, feeder pillars, power distribution board and its type, generator cubical body, cable laders, cables trays and UPS , UPS panels and cabinets. Email us to get our services "zulifiqarali6662@gmail.com" and call us to +923004546662 or +923134546662. thank you for interest.